Summer's in full swing...with bold fashions, bright makeup, fresh fragrance scents, serene spa moments and new novelty accessories for all that fun under the sun. Page 62 - The New Classics - The scents you've always adored, now with a new look as timeless as you. Introducing the Avon Classic's Collection. Always beautiful. Page 14 - The Big Summer Makeup Sale! - Get all your faves or try something new. With hundreds of items to choose from, now's the time to update your makeup regimen. Page 118 - Step up to Foot Works - Our pedi collection has all you need for perfectly pampered, healthy looking and beautiful feet. Now enriched with Keratin to give your lashes intense mega volume. Groundbreaking Wonder Brush delivers panoramic volume from root to tip in just one stroke. Ergonomic fit bends 7 ways for a comfortable, personalized experience. Our Summer Home Fragrance Collection features 4 fresh and fruity scents for summer. Each 3 wick, 11 oz candle gives 30 hours of burn time. 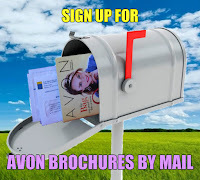 Check out the Spring Savings and Big Save flyers for even more special deals on makeup, fragrance, jewelry, and personal care.